Last month, Codename: Violet took place – a secret project created by the Young Coneys with Greenpeace. It’s been running for the past month but we pinky promised that we wouldn’t talk about it outside of sessions! Over the month a group of the Young Coneys have been developing playful interventions to take to a motor industry fancy dinner to promote Ditching Diesel. We all got clued up on the damage that air pollution can do to our lungs, especially to young people like the Young Coneys, and then began making little games and interactions we could play with our target audience. As ever, there were an abundance of ideas about ways that we could play with the adults, from staring contests (where a child blows in your eyes) to shouting in your ears to see they work! 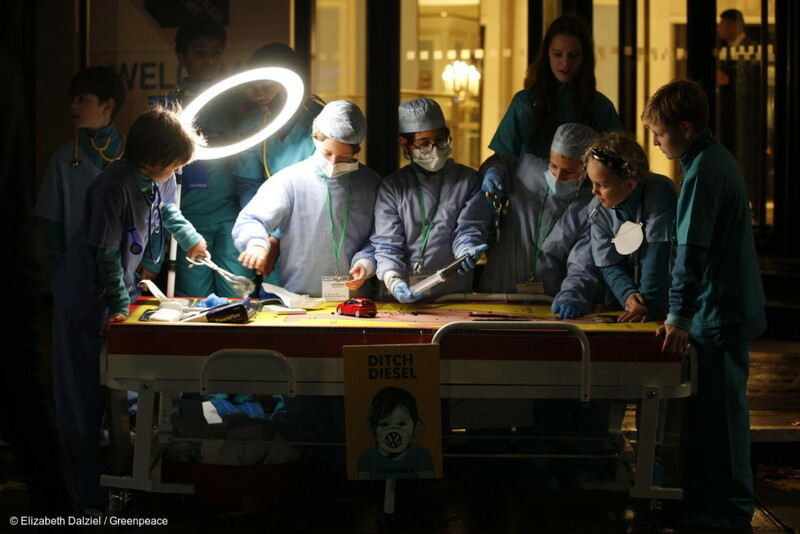 A few weeks later we were ready to embark on our operation at Greenpeace HQ– with a group of VERY junior doctors ready to diagnose and take the discussion around health of young lungs to those who are causing some of the damage. But after weeks of meeting up and plotting our event the wet weather was worrying. We couldn’t run the event if the rain was pouring down – much to the dismay of the Young Coneys, who claimed they didn’t mind! After a long discussion we agreed we would make our way to our secret location, but if it was raining we would have to turn back…. and cancel the secret operation. So off we went, right until the last moment our noses up against the glass, hoping for the rain to stop. Very literally, as we arrived at the location, the clouds cleared and 10 VERY junior doctors jumped out onto the pavement to perform health checks to the guests of the motor industry Christmas gala in West London. We were there about 40 minutes and the Young Coneys met with all the guests entering the event across that time. Some of them arriving on the pavement, could see them a mile away and built sufficient tactics to avoid. Others arriving out of taxis didn’t know what had hit them when they looked up from their wallets to see a stethoscope, a jelly covered toy car and an enthusiastic face. Some guests really embraced the whole thing. As we carried on, one security guard arrived, then a second, third, fourth and fifth. And they started to do extra security checks on anyone entering the building – before the head of security came out to speak to our Greenpeace representative, offering us coffee, and to share his concerns for the Young Coneys getting cold as a reason to stop. We confirmed they were wearing wool base layers and a fleece, politely declined the coffee and carried on! Stood there in front of a swish hotel with 10 of the Young Coneys I couldn’t be prouder of our young people – dressed in full doctors’ outfits with a massive game of slimy operation. They stood up for what they believed in and were brave enough to speak up. I think we could all learn a lot from them. Undercover, uncertain, nerve-wracking and full of determination – it was a very special thing. And so, so incredibly cool. Read the Evening Standard’s article about the project here, and find out more about the Young Coneys here. The Young Coneys are able to attend workshops with Coney thanks to support from Arts Council England and a generous network of individuals. The more support we receive, the more opportunities we’re able to offer this crackly, creative bunch of individuals. If you’d like to support Coney’s work with young people, find out more here or get in touch.